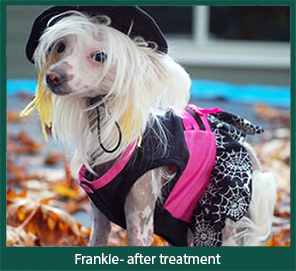 Frankie is a 3 year-old female spayed Chinese Crested Dog with a history of multiple black-heads and few deep nodules on her back and sides of her body. The black-heads and deep nodules do not seem to bother Frankie; however, it is alarming to her mom, Mrs. Seeley, as she does not understand why Frankie’s skin has become so bumpy over the past year. A Chinese Crested Dog is intentionally bred to have regional hair loss of the face, trunk, neck, and upper arms/legs. Other canine hairless breeds include the Mexican Hairless dog, Inca Hairless dog, and American Hairless terrier. The unique genetic mutation affects regional or all hair follicles depending on the hairless breed. The affected hair follicles are abnormal and do not produce hair shafts. These abnormal hair follicles often become occluded with debris and create black-heads, also known as comedones. As these dogs age, comedones become more and more common. Sometimes deep nodules can develop in hairless breeds. These are called follicular cysts which are abnormal deep follicular cysts that continue to expand and accumulate debris. The therapy of choice for the comedones is to use a follicular flushing shampoo such as benzyl peroxide. 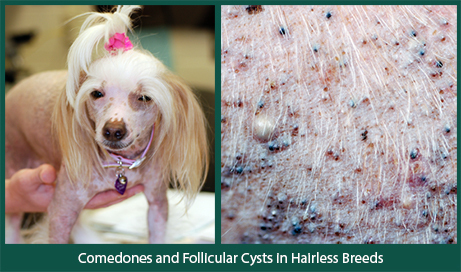 The treatment of choice for follicular cysts includes either observation or surgical removal.